As a child fascinated by tales of exploration and archeology of the artifacts of Egyptian, Greek, Roman, and Incan civilizations, I built models of balsa-wood and modeling clay to recreate in my room the temples and fortresses pictured in my books. I channeled my university studies toward building things, the bigger the better, I thought, as my training progressed. In graduate school I encountered Albert O. Hirschman, a Harvard economist whose seminal book introduced me to the ideas of social overhead capital—the etymological precursor of what we mean today by economic or societal infrastructure—and its essential role in economic development. (1958, The Strategy of Economic Development, New Haven: Yale University Press) I wrote a doctoral dissertation on “systems of constructed facilities,” and from there moved on to planning and design of new cities, airports, highways, and investment policy. I guess it is fair to say I have been interested in infrastructure for a while, and maybe a wonk on the subject. The principles themselves are fairly straightforward, albeit cryptic: (1) Geography matters. (2) The paradigm is broadening. (3) Value the “public” in public works. My interpretation has perhaps shifted in the years since we wrote the report. First, infrastructure should be tailored to the specific physical, environmental, social, and economic characteristics of the area to be served. However, these various characteristics are connected in complex ways that make the tailoring difficult, and we need good data to achieve a good fit. Second, all infrastructure has to be understood as providing multiple services, having not just a single function. Thinking that our highways simply let us move from place to place and water systems only provide a clean supply when we turn the tap is—pardon the possible pun—tunnel vision; we need to broaden our perspectives in funding, designing, and operating each piece of infrastructure and address the system the pieces comprise. Third, the public is a part of the infrastructure, not simply a customer, investor, or impediment. We as a society and our infrastructure are engaged in an evolving dialogue; the better we understand our role in that evolution, the more likely it is that future generations will appreciate the legacy of our infrastructure investment. Two decades later, I think these principles are still relevant and important. They are also, unfortunately, no more representative of current practice than they were when written. urban development. The underlying concepts were hardly revolutionary: Washington, DC, and many state capitals in the United States, for example, as well as Brasilia and St. Petersburg (Russia) had similar origins. In addition Lagos, the capital at the time, had grown beyond the capacity of its infrastructure; the city’s often chaotic services and gridlocked traffic threatened to choke the nation’s development. 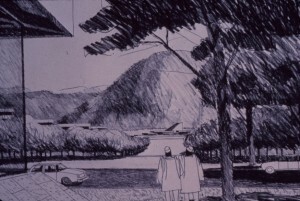 The desire for Abuja to provide a strong image and sense of place, representing Nigeria’s position as the most populous nation in Africa and a rising democratic force in the continent were decisive in the mater plan’s development. 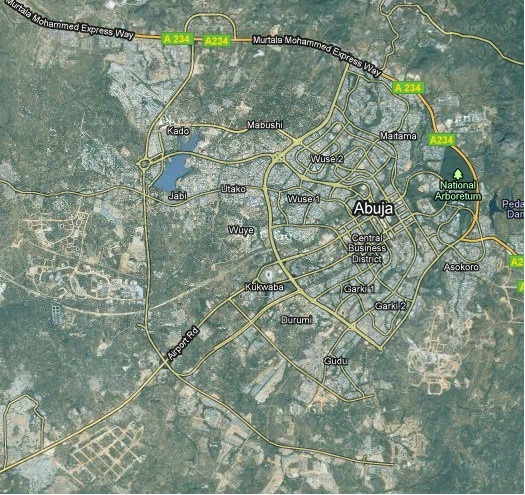 As the capital, Abuja would have symbolic as well as political and economic importance. 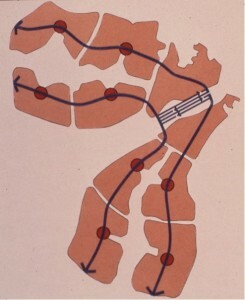 The siting of major government buildings and the layout of the transportation networks were intended to take advantage of dramatic topography and provide the matrix for a centralized urban form easily served by transit. less-developed economy. With a government-set target population of 1.6 million by the year 2000 and 3 million ultimately, Abuja was planned be the largest free-standing new city ever built. 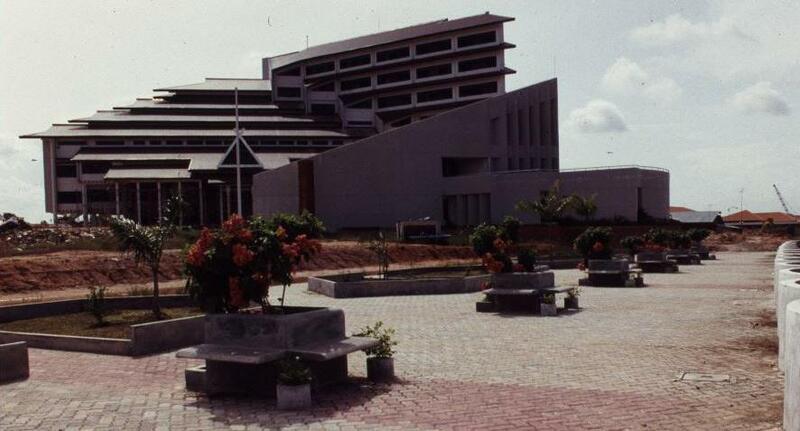 The federal government was to move from Lagos to Abuja by 1986. It has been written that Daniel Burnham said, “Make no little plans. They have no magic to stir men’s blood and probably will not themselves be realized.” Certainly Abuja’s master plan qualified as a grand scheme able to generate a certain excitement. While government functions would be the principal foundation for the city’s economy, the plan represented substantial private-sector investment opportunity and, to use developers’ vernacular, the numbers worked. However, speaking at the American Association for the Advancement of Science annual meeting in Houston in 1978, I noted it would not be easy. Threats to success could be foreseen in potential shortages of construction materials and labor, congestion of the poorly developed transportation network in Nigeria’s Middle Belt region, management challenges associated with such a large-scale undertaking, and the need for steadfast government support of the enterprise. Scottish poet Robert Burns wrote, “The best laid schemes o’ Mice an’ Men, Gang aft agley….” (To a Mouse, 1785) The thought is a suitable caution to Burnham’s successors. Performance is the execution of a task or fulfillment of a promise or claim. Musicians give a good performance when they play well, provide listeners with insights to the meaning and emotion behind the music, and entertain their audiences. Employees of large companies have annual performance reviews to reflect on how well they and their immediate supervisors think they are doing their jobs. For civil infrastructure, performance has something to do with moving people and goods, supplying water, removing wastes, and keeping us comfortable. However, just as we might disagree about whether a singer has given a good performance, individual infrastructure users, companies that depend on infrastructure, government agencies that build it, people who live near the facilities, and others may have their own ideas about both what is the task or promise the infrastructure should fulfill and how well the job is being done. Because these several groups all play a role in shaping our infrastructure, determining how it is used, and taking advantage of the services (or disservices, as some might say) delivered, we often refer to them as stakeholders. These stakeholders are a wonderfully diverse bunch and their ideas are dynamic. Trying to understanding what might be meant by “good performance” for infrastructure gets complicated. The U. S. Army Corps of Engineers in the 1950s and ‘60s built the Buford Dam and others along the Chattahoochee River for power generation, flood control, and navigation purposes. Lake Lanier, a large reservoirs created near Atlanta, Georgia, became an important part of that growing region’s water supply as well as a popular recreation area. Downstream, where the river joins with others rolling south toward the Gulf of Mexico, oyster harvests in Apalachicola Bay depend on the freshwater flows. The states of Alabama, Florida, and Georgia have feuded for decades over the water management in the river basins. Since construction of the Buford Dam and Lake Lanier was completed in 1957, the tasks they are expected to perform have certainly shifted. Sometimes stakeholders are very direct in stating the broader objectives they have in mind. Public works investments during Franklin Roosevelt’s “New Deal” era, for example, were planned to give jobs to some of the legions of people left unemployed by the Great Depression as well as to provide the services of municipal buildings and libraries. Huge water projects built in the vast and largely empty southwestern areas of the United States were intended to enable settlement and consolidate the nation’s hold on land which (to quote Robert Frost’s famous poem, The Gift Outright) “was ours before we were the land’s.” The spending of public funds on new roads and water mains is routinely justified by expected gains in property values and subsequent tax revenues expected when newly accessible and serviced land is developed. Sometimes our objectives are less overt. Some highways built in urban centers during the 1950s and ‘60s were viewed by their planners as instruments of slum clearance as well as transportation arteries. Public backlash gave rise to more general resistance to new construction and the term NIMBY—“Not in my back yard!”—that has since come to be recognized in many languages. A recent Saint Index© survey of U.S. attitudes about real estate projects and development found that our extended economic downturn may be softening opposition to new development in general, 74 percent of American adults still do not want it in their own community. Sometimes we simply have too narrow a perspective. Vitruvius, the 1st Century BC Roman who gave us the 10-book De Architectura, wrote famously that our infrastructure should not only ward off hostile attack, glorify the gods, and enhance public convenience, but should do so with “strength, utility, grace.” A panel of experts convened by the National Academy of Sciences to consider principles for improving the nation’s infrastructure (full disclosure: I served as the staff support and a primary report author-editor) asserted that we must manage our infrastructure to “… incorporate effective recognition of infrastructure as a multimodal and multipurpose system—a stream of services—as well as an armature of community development.” In other words, no infrastructure should be conceived of as doing only one thing. In any case, whether the objectives, promises, or claims are narrowly or broadly conceived, explicitly or implicitly stated, the performance of infrastructure as a public investment must be judged by how well it serves the community. Measuring the return on investment will always be complicated. It hasn’t been for lack of trying. Every newsworthy disaster stirs up swarms of dire warnings: the 2010 gas pipeline explosion that leveled a neighborhood in San Bruno, California; the rush-hour collapse in 2007 of an Interstate highway bridge in Minneapolis; or the 2009 crash of two trains on Washington, DC’s, Metro subway. Following the example set two decades ago by the National Council on Public Works Improvement, the American Society of Civil Engineers periodically issues its Report Card for America’s Infrastructure, giving it a solid “D” in 2010. The trouble is, things don’t look so bad to the average person on the street. Most of us get up in the morning, turn on the lights, brush our teeth, travel to work on paved roads, and are unsurprised when the garbage in our wastebaskets disappears without a trace. Most of us only read about disasters or watch the video, even when the areas affected reach such grand scales as the destruction of New Orleans and the electrical blackout of the continent’s northeast. Talk about necessary maintenance and fixing problems and most of us simply tune out. In the summer and fall of 2010, Maslansky Luntz and Partners (a communications strategy firm) conducted a series of “listening sessions” around the country to learn about why the voters in some states and localities have been willing to increase their taxes to pay for their road systems while so many of our elected officials adamantly resist even mentioning the idea. The work was done at the request of the American Association of State Highway and Transportation Officials, under the National Cooperative Highway Research Program. What the listeners found was that people expect their taxes to pay for maintenance; it’s a given. If those who are responsible for the roads and bridges say that maintenance is being neglected, then they simply haven’t been doing their job, even if the reason is there’s not enough funding. Modernizing, however, improving technology, making things work better…. That’s another story! Fixing the traffic lights so that you never have to sit at a red light when there’s no traffic on the cross street…. That’s worth paying for! Clearing traffic crashes and mishaps quickly to get the traffic moving again; synching bus and train schedules to ensure that a trip by transit goes smoothly, and making sure that there’s a backup bus for when the train does run late; providing better mobility generally, that’s what people want and will pay to get. Extending the message to all infrastructure (and to appropriate a phrase), “It’s the service, stupid!” Infrastructure is a matter of steel and cement only to those who design and build the bridges, dams, and pipes that carry our vehicles, drive our water and electric power systems, and bring fuel to our homes. The essence of infrastructure for most of us is the services provided: If we want to close the sale, we have to offer more and better service, not simply a legacy system in a state of good repair. Concern for the state of our public works infrastructure seems to have percolated to the forefront of current political discourse. The web-based news and commentary site The Infrastructurist, for example, recently presented their “First Annual Infrastructurist Forum” on the future of U.S. infrastructure, attracting statements from such luminaries as Representatives John Mica (R-Fl) and Nick Rahall (D-WV), Chairman and Ranking Democratic Member, respectively, of the House Transportation and Infrastructure Committee; real-estate development expert turned pundit Chris Leinberger of The Brookings Institution; and Forbes magazine columnist Joel Kotkin. Reports on both the national political scene and local issues in The New York Times, TheWashington Post, the Los Angeles Times, and other print media outlets feature the term almost daily. There has not been so much attention to the topic since the months following the 1981 publication of America in Ruins: Beyond the Public Works Pork Barrel, by Pat Choate and Susan Walter. Choate and Walter warned that government spending on infrastructure had failed to keep pace with the nation’s needs, causing our public facilities to wear out faster than they were being replaced. The book sparked national debate about not only how much we should be investing in infrastructure, but also whether such public investment is worth making. So an argument can be made that public investment does yield net returns. But how much investment is needed to maintain productivity and growth? Walter Rostow’s seminal book The Stages of Economic Growth: A Non-Communist Manifesto appeared in 1960, asserting that economies launching into modern industrial growth show investment rates rising from about 5% of the national income to 10% or more. The CBO study shows U. S. investment in transportation and water infrastructure has been below 2.5% for some years; allowing for spending on other infrastructure (such as waste treatment facilities or schools, for example) would certainly increase this percentage, quite possibly to a level within Rostow’s range. What has been neglected in all of the analyses that I have seen is an explicit consideration of maintenance spending, as distinct from investment. Infrastructure, like most engineered systems, requires periodic care to keep it functioning properly. Leaves, trash and other debris clog drains that channel rainwater away from roadways must be cleaned out. Filters that remove silt and bacteria from drinking water must be flushed. The costs of such maintenance effort typically are accrued in different accounts from those the represent “investment.” But if maintenance is neglected, the quality of services and longevity of facilities will be impaired. My discussions with people who manage maintenance in public works agencies suggest that maintenance budgets are often squeezed, forcing neglect. In the absence of data and solid analysis for estimating appropriate levels of spending, I have found that many facilities managers use as a rule of thumb that about 2% of the current replacement value of the facility should be spent annually on routine maintenance. (For example, see Committing to the Cost of Ownership: Maintenance and Repair of Public Buildings, 1990, The National Academies Press, the report of a study I worked on with a number of government facilities managers.) Spending less (assuming the money is used effectively) risks premature deterioration and failures. Failure of the Interstate 35W bridge collapsed in Minneapolis in August 2007 and rupture of a 66-inch water main in suburban Washington, DC, in December 2008 are two of many examples of such risks becoming reality. The point is, we really do not know how much we need to spend for our infrastructure. But the evidence suggests we need to spend more than we do now. 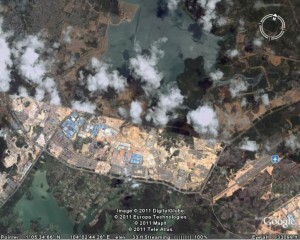 I used Google Earth to visit Batam Island in Indonesia last week. The trip was certainly easier than the nearly 24 hours of flying and layovers required when I made the trip from Washington two decades ago, and the view from above was an exciting indication of changes on the island. But it was no substitute for being there in person. 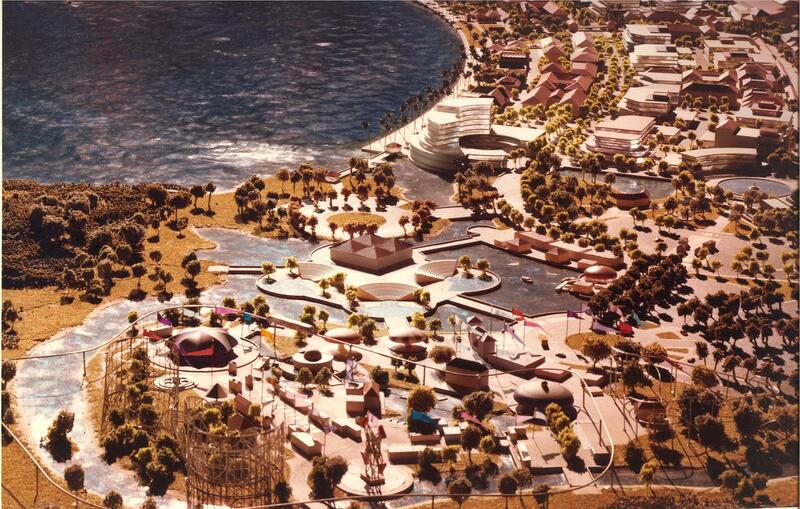 I spent Christmas of 1983 with a band of like-minded planners and architects on Batam Island. The rooms that we occupied were converted shipping containers, at one of the few hotels available. The power went out on Christmas Eve, an almost daily occurrence, as we gathered with flashlights and candles in one room to open a few gifts thoughtfully provided by our colleagues back home. With the tropical rain pouring down, we turned in early to be ready for the big day to come. The story started a year earlier. 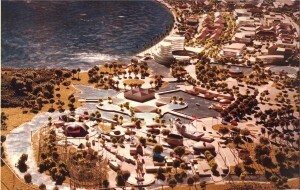 Planning Research Corporation was engaged by the Batam Industrial Development Authority (BIDA), then part of Indonesia’s Ministry of Technology, to prepare a master plan for Batam Centre. (British spelling seemed to be the norm for English usage in Indonesia.) We were teamed with an Indonesian firm, P. T. Atelier 6. Prof. Dr. Eng. 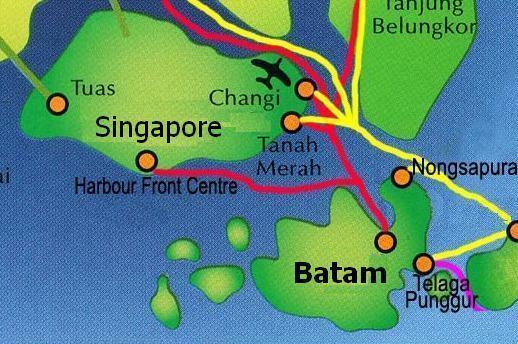 B. J. Habibie, Minister of Technology and Chairman of BIDA, was determined that Batam should be a free-trade enclave and focus for economic development as part of the Straits of Malacca (Singapore Straits) region. (Habibie, who later became the president of Indonesia, continues to influence the island’s development.) 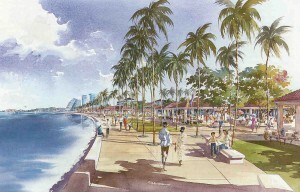 The governments of Singapore and Indonesia had agreed to cooperate. Batam is located about 20 km southeast of Singapore, a short hydrofoil ride from that high-tech island nation.. Batam Centre was to be the administrative and commercial core of the island, a thoroughly modern enclave that would be a comfortable entry for foreign investors and an attraction for vacationers seeking a taste of Indonesia’s rich and colorful culture. As project manager and team leader, I was determined that the plan should be a practical roadmap and model for improved living standards in a growing economy as well as a resource for marketing a nation. We conducted the usual economic analyses and demographic studies to project plausible population and income scenarios for the island and our emerging concepts of the new city’s role in the region. We extracted organizing principles from lessons learned about traditional villages and urban form, the social structure of Indonesia’s communities and neighborhoods, and the layers of government established to provide infrastructure and social services. We studied the topography, soils, hydrology, flora and fauna to understand the environmental opportunities and constraints that should shape development. Scottish poet Robert Burns, wrote, “The best-laid schemes o’ mice an ‘men gang aft agley,” and so it was with our own scheme to continue working with BIDA to implement our Batam ideas. By May of 1984 our work was finished, left for others to consider. I was invited back in 1991 to review progress. Major roads were in place and our plan was displayed in the visitors’ center BIDA had constructed on the site we had proposed. 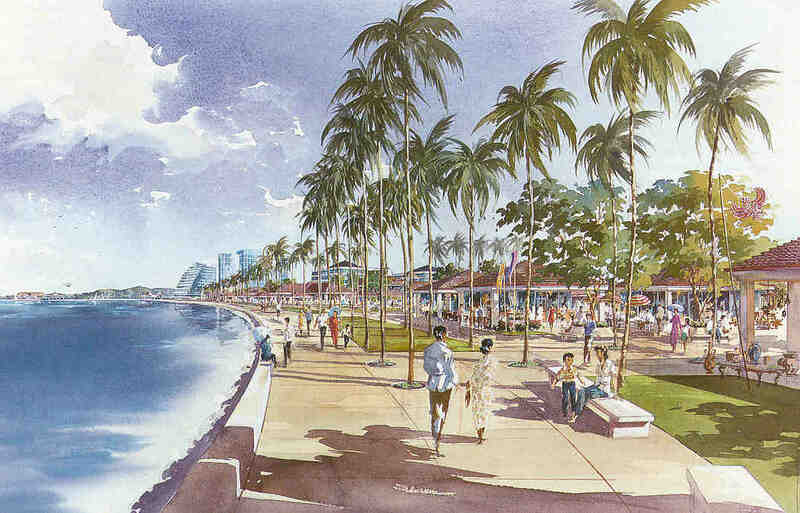 Perhaps it was chance, but I prefer to believe that the physical, social, and economic framework our team laid out 20 years ago has served its purpose as an infrastructure for Batam Centre’s development. If my satellite-enabled flyover is to be believed, the texture of credibility is becoming a reality.